Entrepreneurship has, in recent years, become a main policy focus in Tunisia. TEA rate has fallen, compared to 2009 and 2010 to 4.8%. TEA rate for Tunisia is made up of 2.38% adult population engaged in nascent entrepreneurial activity and 2.48% for adult population already involved in ownership of a young business. Nascent entrepreneurship rate has observed a slight increase from 2.2% in 2009 to 2.4% in 2012 while new business rate declined from 7.2% in 2009 to 2.5% in 2012. Results indicate a lift in the business failure rate created beyond the start-up phase explained by an economic environment strongly affected by the social and political unrest following the 2011 revolution. There is a tendency to decline in the total early stage entrepreneurial activity in the youth population from 9 to 2.32 from 2009 to 2012 due mainly to structural factors inherent to the economy and society. In 2012, Tunisians are incidentally less vulnerable vis-à-vis risk of business failure and only 15% of the population between 18 and 64 years expresses their fear of failure compared to a higher risk perception of 34% in 2009 prior to the revolution. Tunisia nascent entrepreneurship remains more driven by improvement- than by necessity in 2009-2012. Nonetheless, the gap between necessity and opportunity entrepreneurship has lessened in 2012 indicating a shift in the quality of entrepreneurship. APS results confirm the persistence of the gender gap with respectively a TEA rate of 6.75% for male and 2.87% for female. Moreover, women in Tunisia are more likely to be opportunity-motivated and the survival rate of Tunisian women’s business is lower. New entrepreneurs are more often associated with smaller businesses and necessity-based entrepreneurship. Grand Tunis and south-west regions have the lowest TEA rates (4.1% and 3.6%) in the country. South East and the Center East have the highest regional TEA with respectively 6.1% and 5.3%. Sidi Bouzid, one of the governorates that triggers the revolution in the country, has the highest necessity TEA in the Tunisia while the highest opportunity entrepreneurship is observed in the Grand Tunis and East Coast. An analysis of entrepreneurs’ network structure in Tunisia highlights the importance of private entrepreneurs’ network and indicates that strong ties with family, perhaps through providing intangibles such as emotional support and tangible resources, could have a positive impact on firm survival. More precisely, results show that 51% of Tunisian entrepreneurs consult widely their private environment composed of spouse, parents, other family members and friends and only 4% take advises from their current boss, colleagues, people who started businesses and people experienced in the businesses. The findings also reveal that the entrepreneurs’ network in Tunisia is not diversified and is limited only to the social private network made up of the family and parental relations. 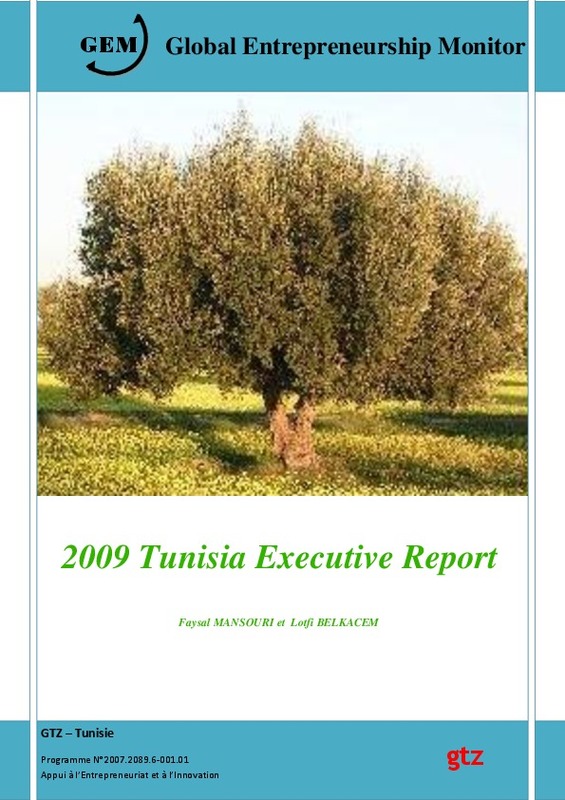 An analysis of the opinions of national experts on the benefits of the current conditions of entrepreneurial activity in Tunisia, stresses the positive role of available public programs, regulatory framework, developed physical and commercial infrastructure conducive to investment and entrepreneurship. This is the second participation of Tunisia in GEM activities and the year that has known the beginning of the major social and political turmoil that have led to the historical 14th January 2011 revolution. Indeed, early-stage entrepreneurial activity in Tunisia has decreased to 6.12%; comprising 1.73 % nascent entrepreneurship and 4.44 % new firm entrepreneurship. Established business ownership rate measures about 9 %. As found in the 2009 GEM results, entrepreneurial activity is driven more by opportunity rather than necessity with 75 % of entrepreneurial activity being motivated by opportunity and only 25 % is driven by necessity. Male entrepreneurial activity is nearly two times higher, namely 67 %, than that of females, namely 33 %. Gender entrepreneurial gap has globally decreased compared to 2009. Results also show that 69 % of male entrepreneurs are driven by opportunity while this rate is even higher about 85 % for female entrepreneurs. Clearly, female entrepreneurship involvement has increased compared to 2009 findings. The APS survey reveals that 24.4 % of Tunisians expects to start a new business within the next three years. We find that 37.21% of individuals involved in entrepreneurial activity for an opportunity motive are mainly interested in increasing personal income, while 13,3 % are mostly concerned with greater independence. In the meantime, 25.75 % who pursued non-opportunity motives were driven by a desire to maintain personal income. In term of growth aspirations, results show that 10.06 % of all early-stage business entities are expecting 10 or more jobs 5 years after the business have started. Among individuals involved in entrepreneurship activity 53.3 % expect to create between 1 and 5 jobs, while 24.4 % expect to create between 6 and 19 jobs and only 17.8 %% have expectations of more than 20 jobs. This indicates better growth aspirations compared to 2009 expectations which in turns indicates a relative improvement in the quality of entrepreneurship in Tunisia. APS results reveal that both North East and West Central region have the highest rate of entrepreneurial activity in the country in 2010. The Central-East of the Tunisia has the highest mâle TEA (11 %). 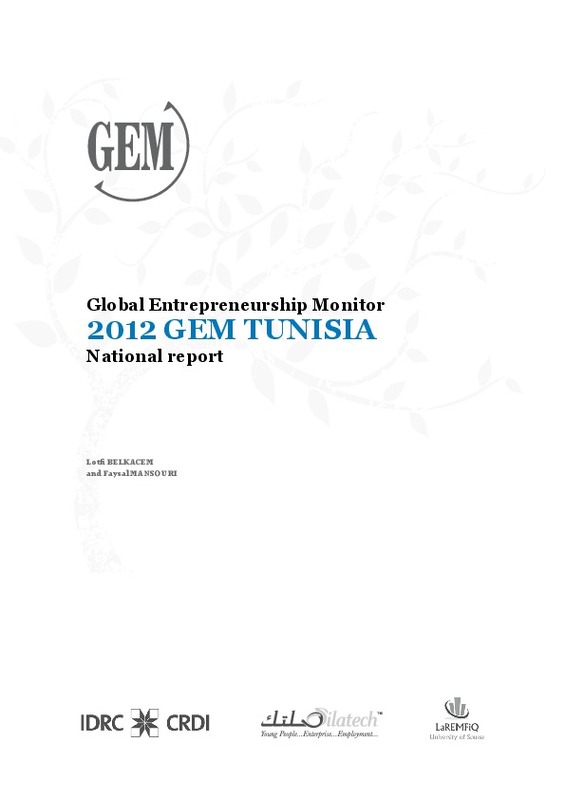 Compared to 2009, Grand Tunis entrepreneurial activity involvement has decreased despite being first nationwide in term of male participation. 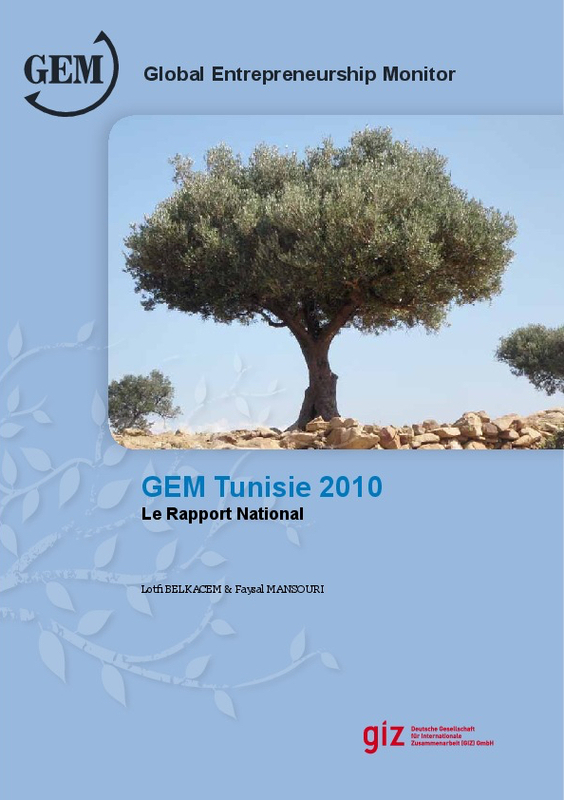 This is the first participation of Tunisia in GEM activities. Early-stage entrepreneurial activity in Tunisia measures 9.4%; comprising 2.2% nascent entrepreneurship and 7.2% new firm entrepreneurship. The established business ownership rate measures 10.2%. Entrepreneurial activity is driven more by opportunity rather than necessity with 77.7% of entrepreneurial activity being motivated by opportunity and only 23.3% is driven by necessity. Male entrepreneurial activity is about three times higher (at 73.0%) than that of females (at 27.0%) and the results show that 71.1% of male entrepreneurs are driven by opportunity while this rate is about 66.5% for female entrepreneurs. The survey reveals that 57.6% of Tunisians expects to start a new business within the next three years. We also find that 51.4% of individuals involved in entrepreneurial activity for an opportunity motive are mainly interested in increasing personal income, while 11.6% are mostly concerned with greater independence. At the same time, 22.3% who pursued non-opportunity motives were driven by a desire to maintain personal income. In term of growth aspirations, results show that 7% of all early-stage business entities are expecting 10 or more jobs 5 years after the business have started. Among individuals involved in entrepreneurship activity 61.3% expect to create between 1 and 5 jobs, while 19.4% expect to create between 6 and 19 jobs and only 11.8% have expectations of more than 20 jobs. Experts believe that the Tunisian government has made entrepreneurial developments a national priority. Indeed, several acts of legislation, economic incentives and governmental programs and institutions have been established in order to boost business creation, in particular by university graduates. Entrepreneurial education is being introduced and reinforced within the higher education system in order to develop a nationwide entrepreneurial culture and prepare the emergence of new generations of entrepreneurs. Tunisia has managed to avoid direct hit by the recent financial turmoil. This is due to a prudent financial and economic policy and to partial openness of the Tunisian stock market to foreign investors and to foreign assets. Nevertheless, exporting firms have been affected and to some degree by the economic repercussions of the financial crisis. Experts attribute this exposure to the relative dependence of these activities to the European markets. In order to hold down the impacts of world economic crisis, decision makers in Tunisia have adopted a comprehensive set of policy measures that includes the creation of a strategic investment fund (1% of GDP), boost the infrastructure programs, set up credit lines destined to support financial restructuring of key business operators as well as more strict regulation on bank placements. Official statistics show an increase of 12.7% for declared investment in Industry during the first 9 months of 2009, while declared investment in services sector has increased about 16.5% during the same period. In terms of growing businesses, difficulties are felt more strongly by nascent firms, while established ones are doing better. Indeed, only 17% of early-stage entrepreneurs and 31% of established entrepreneurs believe that growing a business now is more difficult than one year ago due to crisis repercussions. These low figures tend to confirm that the world economic turmoil did not have severe incidence on young business development. Nevertheless, 47.6% of early stage entrepreneurs find some difficulties in starting a business as a result of the economic crisis.